Maintaining your car can be very costly, time-consuming, and confusing. However, it is a very important task to protect one of your biggest investments. Therefore, knowing some of the most important things to help you maintain your car and extend its life is of great value and something every car owner should know. Following a few simple tips to maintain your car can protect your investment and help your vehicle stay operational and on the road. Washing and waxing your car regularly can help extend the life of your vehicle. Washing can help your vehicle look good at all times and keep dirt and grime from embedding into your car and eating away at the paint. Waxing can help seal the paint and keep out the bad things that cause deterioration to your vehicle's exterior. In addition, a good wash takes care of the dirt and grunge on the under carriage of your vehicle where corrosion and rust can easily begin. Washing the tires and wheels can help keep dirt and road debris from affecting the tires and hubcaps. A good wash can be critical to the overall care of your car. One of the best things you can do to keep your vehicle operating safely on the roadways is to prepare it for the season in which you are driving it. Know your climate and the precautions you should take to prepare your car for the upcoming season and plan. This means that in the summer month you will want to change your coolant and ensure that the coolant is right for your car and filled to allow your engine to run well in the hot condition. Conversely, in the winter months, you will want to have the right anti-freeze in your car, consider anti-freezing washer fluid to keep you seeing clearly and not tear up your windshield wipers, and consider snow tires, especially if your climate is prone to lots of snow and ice. Winter tires can provide you with the added traction and control that you need in winter road conditions. It is imperative that you read your vehicle's owner's manual and follow the recommended maintenance schedule if you want to keep your car on the road for many years to come. Following the recommended maintenance schedule can help ensure that potential issues are identified before they become hazards and is likely to save you money in the long run. If you want to extend the life of your vehicle, it is important to do the recommended transmission checks, tire rotations, belt replacements, and fluid flushes, to name a few. Along the same line as following the manufacturer recommended maintenance schedule, it is advisable to change the oil in your car regularly, as recommended by your vehicle's manufacturer. This is typically between 3,000 and 6,000 miles; however, it is best to read your manual and determine the best schedule based on your driving habits. In addition, in order to keep your vehicle running smoothly, you need to use the correct oil for your vehicle. You don't need to do a bunch of research or switch your oil each time you head to the shop to have the oil changed, simple use the oil that is recommended for your car and you will be in good shape. #5 - Give it a Periodic and Regular "Once Over"
What does this mean? 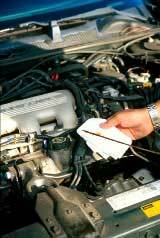 Periodically, take a minute and make sure that you are checking your car all over. Occasionally check your gas mileage and make sure it is still consistent; a drastic change can mean there is something wrong. Look for dings, dents, and scratches and seal them immediately, this can help prevent rust and extend the life of your car. Check fluid levels to ensure they are at the proper level to keep belts and filters operating properly. And look up any codes immediately to ensure you take care of anything your car is telling you that needs your attention. Taking care of your vehicle is important. Following a few simple steps to maintain your car can help ensure that your vehicle stays in good operating order and keeps you on the road in a reliable and safe car for your whole family.